The AHA is a Red Cross alternative for a 2 year CPR certification class. Did you know that Healthcare workers are required to retake the American Heart BLS certification class every two years. Not in Healthcare? We have about 30 percent of our students who are not in the medical field. You are welcome to take any of our classes. We have many laypersons who attend including teachers, new parents, scout leaders, childcare, baby sitters, and others. 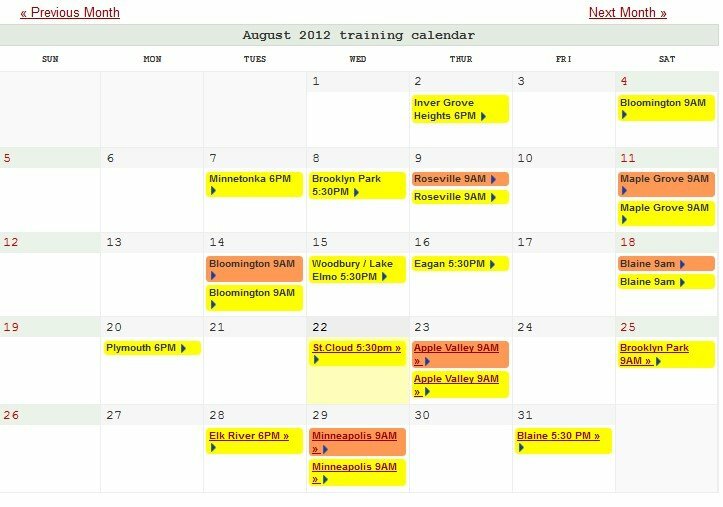 Click on the calendar image to view our training schedule & CPR training class locations including class sites across Southeastern Pennsylvania Philadelphia-Camden-Wilmington, PA-NJ-DE-MD. We have a class near you. We have CPR training classes in Philly area about 3 to 4 times a week. BLS Provider or also known as BLS for Healthcare Professionals: Basic Life Support requirement: Nurses, dentists, hygienists, nursing students, dental students, pharmacists, emergency medical technicians, physicians, professional rescuer, respiratory therapists or anyone in the health-care industry required to have CPR training. All non-medical individuals can also take the BLS Provider course, including daycare providers, warehouse staff, massage therapists, lifeguards, teachers, office staff, church staff, daycare providers, safety committee staff, yoga or fitness instructors, parents or grandparents, scout leaders, teens, etc. Healthcare Provider: Has been renamed BLS Provider.